The protests staged outside certain media institutions in Colombo last week by a group of civil society activists with the sinister warning “We are watching you!” is a subject for some speculation. Politically-motivated physical or verbal attacks on media institutions in Sri Lanka are not a new phenomenon. However the recent event aimed at intimidating sections of media – particularly the popular Sirasa, Hiru and Derana TV channels – drew attention, among other reasons, possibly because it differed in certain ways from previous confrontations. The protesters claimed to be simply ‘pro-democracy,’ and directly accused the media channels of being party to an ‘undemocratic conspiracy.’ Their statement indicated what they meant by this – the reportage by these news outlets on the 51-day dispute between Prime Minister Ranil Wickeremsinghe and President Maithripala Sirisena, that started with the sacking of the PM by the President on Oct. 26, followed by his move to dissolve parliament. The ruling UNP (United National Party) has since issued a statement disassociating itself from the demo, but not condemning it. Rather, the statement admits indirectly that these were the same civil society activists who supported the UNP leader, Prime Minister Wickremesinghe, during the standoff. The UNP statement also condemned what it called ‘black media’ – a term that has been used by Wickremesinghe previously to criticize sections of the news industry. Meanwhile other parliamentarians, including some from the UNP, have publicly denounced the protest. The discerning public may have noticed that the use of the colour black has recurred in a number of ways, in various politically-relevant contexts, in recent months. The civil society organisations (NGOs) that demonstrated last week – listed by name in other print media – wore black and covered their mouths with black bands. Coincidentally it was reported in the Daily Mirror on the same day (Jan. 10) that 22 civil society groups have teamed up with the proposed UNP-led alliance formed to contest upcoming elections, called the Democratic National Front. Representatives of these NGOs will be on the executive committee of the alliance, the report said. There are ominous signs that this year, more than in previous election years, the media will be a critical battle ground on which electoral contests will be fought. In an opening salvo government advertising has been withdrawn from Hiru and Derana TV. In December, shortly before the Supreme Court verdict on the disputed dissolution of parliament, UNP General Secretary Akila Viraj Kariyawasam announced a UNP rally to be held on Dec, 17 and called on participants to wear black. (Why black and not green which is the UNP’s colour?) And last October, plantation workers staged a protest in Colombo on Galle Face Green dressed in black. It is a matter of some speculation as to how estate workers struggling to secure a Rs.1000 daily wage, had the means or inclination to acquire black clothing specially for a demonstration. Was it supplied by others? According to reports this demo had been organized through social media, and politicians representing the plantation community were not involved. How does this relate to the phenomenon of ‘colour revolutions?’ Several such political upheavals that took place in the post-communist world in the last few decades have been associated with the hedge-fund billionaire George Soros. He is also described as a philanthropist on account of his funding for NGOs that fit his ideological bill. The neo-liberal/globalisation reforms and regime change operations said to be linked to activities of Soros’s ‘Open Society Foundations,’ funded by billions of dollars from his vast fortune, are well documented. The most well known among them are Georgia in 2003 (the ‘Rose Revolution’), Ukraine in 2004 (‘Orange revolution’) and Kyrgystan in 2005 (‘Tulip’ or ‘Pink Revolution’). “… the main and direct causes of the colour revolutions were United States foreign-policy interests … as they were serviced by International Non-governmental Organisations (Ingos).” The Professor and Dean, Jindal School of International Affairs, India, said that “Without the intervention of these US-sponsored Ingos, the political landscapes in countries like Georgia, Ukraine and Kyrgyzstan would not have been repainted in new colours.” He asserted that the Soros Foundation and Freedom House “pumped in a steady flow of funds through INGOs and local NGOs for ‘elections-related projects’ in Ukraine. 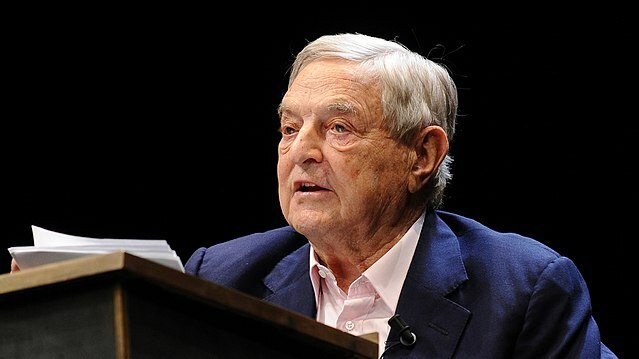 Soros’s foundation was banned from Russia in 2015 for allegedly being a ‘threat to national security and the Russian constitution.’ Last year according to reports it was compelled to close its offices in Hungary and to pull out of Turkey, owing to the displeasure of those governments. However if speculation that Soros is meddling in Sri Lanka is to be sustained, his purpose could not logically be seen as overthrowing the incumbent pro-western regime with its neo-liberal agenda but rather, protecting it. Open Society Foundations website shows that it has been active in Asia (India, Pakistan, Myanmar) for some years. In Sri Lanka, news reports that Soros’s foundations were to ‘start work’ in the country first appeared in August 2015. The next that Sri Lankans heard of Soros was in January 2016 when he landed in Colombo to attend the ‘Sri Lanka Economic Forum 2016.’ The Daily Mirror reported that the event was organized “with the full backing of the Prime Minister Ranil Wickremesinghe.” But the PM later sought to distance himself from Soros and was reported saying “The Government did not invite Mr. Soros for the economic forum in Colombo and neither was it funded by the Government, it was Mr. Soros who came to Sri Lanka and conducted the forum and invited me to participate in it.” This was in response to a question asked in Parliament in March 2016. The use of a particular colour for marketing and ‘branding’ of campaigns, was a characteristic of the colour revolutions. With the colour black repeatedly making its appearance in the statements and events organized by the UNP and its affiliates, and at other seemingly unconnected events like the plantation workers’ protest, the meaning of this ‘colour-coding’ remains to be determined by an alert public. Could the history of ‘colour revolutions’ elsewhere possibly provide some clues?